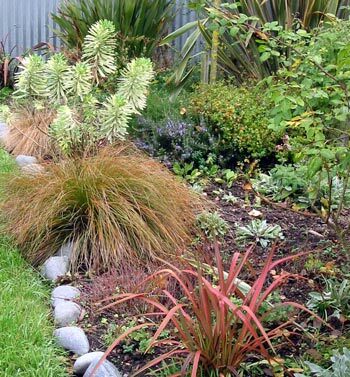 Many gardeners go through a variegated phase, often as they gain in confidence. I used to hate the garish yellow and green shrubs I'd see in garden photos. I'd read so many times that these plants were somewhat vulgar, to be used with discretion. In my early gardening days I lacked the confidence to think for myself, and I though (mistakenly) that there were rules which I should try to obey. That was then, but this is now! I've learnt that there is so much more to variegation than yellow and green, and that I love the fun and the design in such plants. This variegated euphorbia is one of my favourites, ordered from a mail order catalogue. 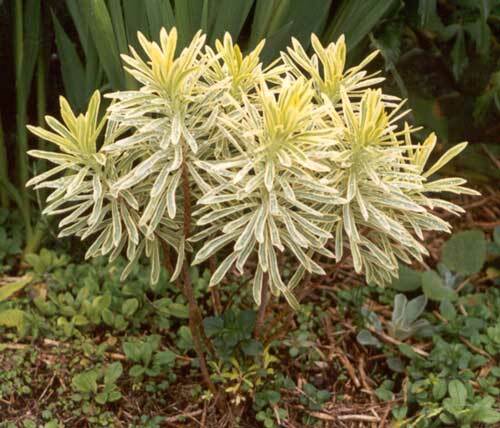 I planted the new euphorbia, named Euphorbia Characias Burrows Silver, in the Stables Border without really thinking too much, and then promptly forgot about it. It really is the most beautiful plant, and I love its cream and soft sage green leaves. Two years later it seems happy in the hot dry Stables garden. I've tried growing cuttings from it without success. Luckily this Autumn it is offered again in the catalogues, and I have ordered another plant. I do now have a second variegated euphorbia which has spent its first Moosey year in a pot on the patio. Before next spring I'll plant it in the garden - maybe in the Stables Garden alongside the other one!